Hamburg, NY — Rebel Voyager ($7.90) toured the Buffalo Raceway half-mile oval in a seasonal best 1:54 to take a 1-1/4 length decision over Upfront Countryboy in the co-featured $12,000 Class AA pace on Saturday evening (April 13). Rebel Voyager captures his fifth win of the season from eight starts at Buffalo Raceway on Saturday. Steve Roth photo. In the other featured division, Golden Gesture used :28.2, :57.3 and 1:27 splits off the rail and was looking for any challengers in the lane but found no takers in producing the solid length triumph. Beachy Dream (Cummings) took the second place check with Andy’s Ideal (Mike Caprio) cruising into third. Golden Gesture (Shark Gesture-Black Gold Mindale) is trained by Mike Ohol and owned by Finocchario’s Dream Stable. The 6-year-old gelding, now a winner twice in 12 starts, has produced a bankroll of $18,158 this year and $168,734 in his career. Racing will continue on Wednesday evening at 5 p.m. with a nine-race card scheduled. 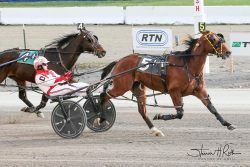 For more information including the latest news, race replays, results, entries, upcoming promotions and simulcast schedule, go to www.buffaloraceway.com.